If you are looking for a firearm accessory that can help you attain different degrees for your shooting preferences then what you need is a bipod. Today, the market is currently flooded with a plethora of choices and picking the right one may prove to be confusing and difficult. Here, you will learn some important pointers that will lead you to pick the best bipod for Remington 700. Now let us get started with the comparison using the following criteria: quality, price, durability, performance and price. Atlas Bipod w/ADM 170-S Lever BT10LW17. For quality, this bipod for Remington 700 has the following things to boast in terms of its quality: mounts directly to any 1913 Picatinny rail using the ADM-S Lever which is also included; height ranges from 4.75” to 9” and weighs 12.7 ounces only. Genuine Accu-Shot Atlas Bipod BT46-LW17. Like the first option, this bipod also mounts directly to any Picatinny rail with ADM-S Lever included and height range also ranges from 4.75” to 9”. There are certain things that make this product different from our first option and these include the following: 15 degrees of positive-negative of preloaded Pan, 15 degrees of positive-negative of preloaded Cant and 13.61 ounces for its total weight. BT10 Atlas Bipod Standard Two Screw 1913 Rail Clamp. In comparison, this bipod has the following things which are similar to the first two options on our list: can be mounted directly to any Picatinny rail via the ADM-S Lever which is also included in the package and height ranges from 4.75” to 9”. The big differences are as follows: weight is 11 ounces only, constructed using T6060 Aluminum and hard anodized and it makes use of a 2-screw clamp for assembly. Like the second option, it is also enhanced with built-in Pan and Cant that can go up to 15 degrees of positive-negative preloads. Price is something that one should focus on when looking for firearm accessories like a shooting mat. Prices usually vary depending on the brand of the product and this proves to be true when you are looking for the best bipod for Remington 700. Atlas Bipod w/ADM 170-S Lever BT10LW17. This product is actually positioned in the middle as far as price is concerned. Tagged with a price that’s less than three hundred buck, this bipod makes an excellent option considering that it has features that can truly enhance your firing and shooting activities. Genuine Accu-Shot Atlas Bipod BT46-LW17. This bipod proves to be more expensive than our first option and the most expensive among the three. It comes with a tag price of more than three hundred dollars, making it as an excellent option considering that it is popular and teeming with good features as well. If you are willing to spend more for a bipod then this can be a good option for you. BT10 Atlas Bipod Standard Two Screw 1913 Rail Clamp. Compared to the first two choices we have, this bipod is offered at the lowest price. You can’t go wrong with this bipod because you can enjoy cool features and shooting enhancement without spending too much for it. Apart from quality and price, another factor that you need to take note when looking for a reliable bipod for Remington 700 is durability. With a durable bipod, rest assured that you will have something that will keep you company for always and for a much longer period of time. Atlas Bipod w/ADM 170-S Lever BT10LW17. This bipod is constructed using the finest materials and built to the highest standards in the United States. Genuine Accu-Shot Atlas Bipod BT46-LW17. Compared to the first option, this bipod is also made from high quality materials considering its high price tag. It only differs in a way that its legs are constructed from T7075 that simply makes it much tougher and sturdier than the first one. BT10 Atlas Bipod Standard Two Screw 1913 Rail Clamp. Like the first two options, this bipod is also manufactured using the highest standards in the USA. While the second option is made from T7075, this one boasts its T6061 Aluminum and hard anodized construction for a much better sense of durability you can count on. Atlas Bipod w/ADM 170-S Lever BT10LW17. 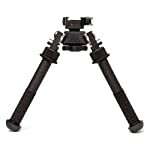 The legs of this bipod can move independently and can be deployed in 45 degrees position either backwards or forwards. It locks securely into five positions via a 180-degree arc. It works to help you align your cross hairs on the target easily regardless of the terrain. Genuine Accu-Shot Atlas Bipod BT46-LW17. This bipod has all the capabilities of the first option and with the following things to add up: leg positions are stowed back and 90 degrees straight down, 45 degrees forward and stowed forward, non-rotating legs, and Aft and Fore pivot limiting bosses. BT10 Atlas Bipod Standard Two Screw 1913 Rail Clamp. This may prove to have lesser features in terms of performance when compared to the first two options but considering the price, this bipod exudes characteristics that can truly enhance your shooting and firing performance. These include the following: legs are notched for a positive lock on your preferred length (five available positions) and provide you with a curl grip area. Feet are detachable by just pressing the pin and can be replaced with any other Atlas legs. Atlas Bipod w/ADM 170-S Lever BT10LW17. This bipod can be positioned either forwards or backwards without the hasle.it also locks securely into five positions and provides easier ways to shoot your target regardless of the terrain. Genuine Accu-Shot Atlas Bipod BT46-LW17. This one has the features of the first option yet enhanced with additional features that spell out its good performance: leg positioned can be stowed back at 90 degrees straight down and 45 degrees forward and stowed forward. It also features Fore and Aft limiting pivot bosses and non-rotating legs. BT10 Atlas Bipod Standard Two Screw 1913 Rail Clamp. This bipod is the simplest in terms of mechanism when compared to the first two options as it boasts the following to spell out its performance: 2-screw clamp assembly, a knurled grip area and legs are removable by simply pressing the pin. In totality, it is the BT10 Atlas Bipod Standard Two Screw 1913 Rail Clamp that won the race based on the criteria that we used in this review. As such, this bipod from AccuShot makes the best bipod for Remington 700 for you. How to Find The Best Scopes for Coyote Hunting 2019?